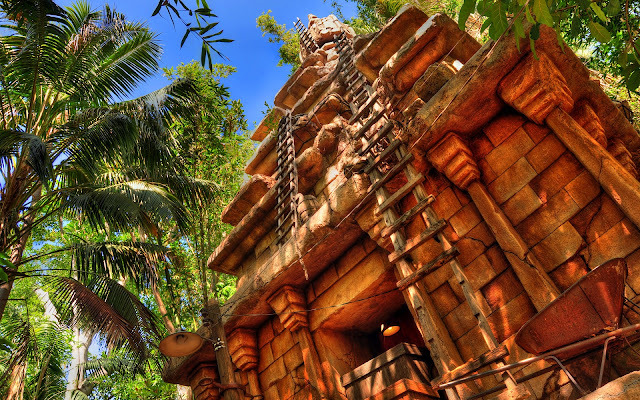 Deep within the mysterious jungles of Adventureland lies the Temple of the Forbidden Eye. Oh, it may look like a precious archeological treasure from the outside, but more sinister features lurk within. Falling stone pillars, rooms full of spikes, untouched caverns, and victims of past explorers all lie wait. And if you make it through, you still have to deal with the wrath of Mara, a none-too-forgiving diety. Somehow, this never seems to deter the tourists that form hours-long lines to seek the riches within. Ain't that intriguing? The Temple of the Forbidden Eye, looking not quite so forbidding on a warm, summer day.